Goal: Create a new website for 110stories—a cutting-edge augmented reality (AR) storytelling service—with a design and user experience that represents its own storytelling ethos and showcases its projects. 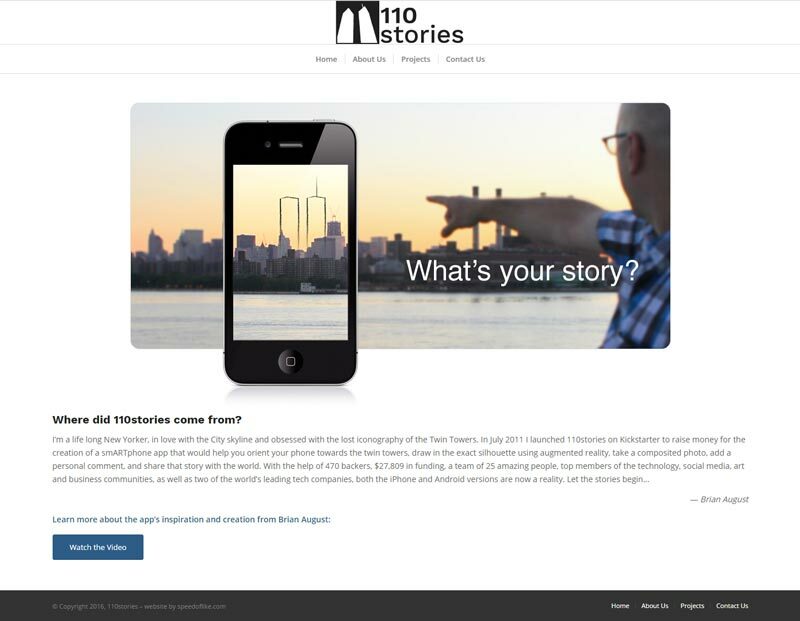 Inspired by the desire to share stories of the original World Trade Center, 110stories creates apps that tell the stories of the world around us, its past and its present. By using augmented reality, 110stories helps users envision the possibilities. Adding in a layer of social interactivity, they turn individuals into a community. Beyond a visual representation, a website must tell the business’s story—what makes them different from every competitor. Speed of Like worked with 110stories to create a brand that refine their messaging and tell their story, showcasing their unique perspective. 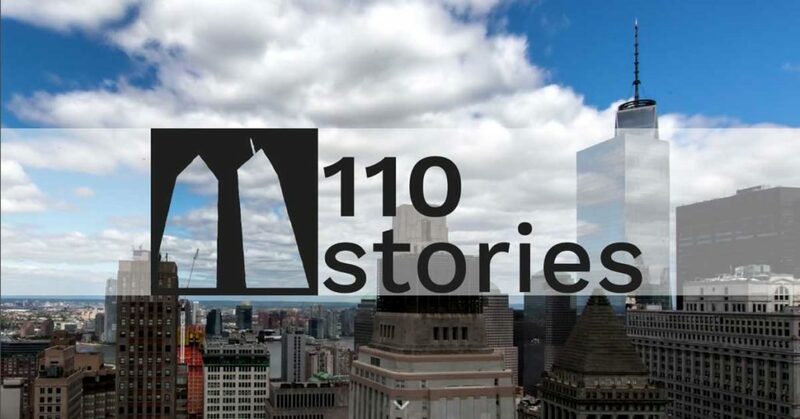 110stories began as an app for sharing stories about the 110-story Twin Towers, which were lost on 9/11. Now that they are an established company creating augmented reality applications for various clients, they needed branding that reflected their origins, as well as their mission. Speed of Like presented multiple logo concepts, working with 110stories to create and refine their new logo. The negative-space “cutout” of the iconic Twin Towers (World Trade Center) in the image represents not only what was lost, but also what is possible, incorporating past and future. Infusing a “hand-drawn” feeling to the outline suggests that the AR stories 110stories helps businesses tell are both personal and subjective. 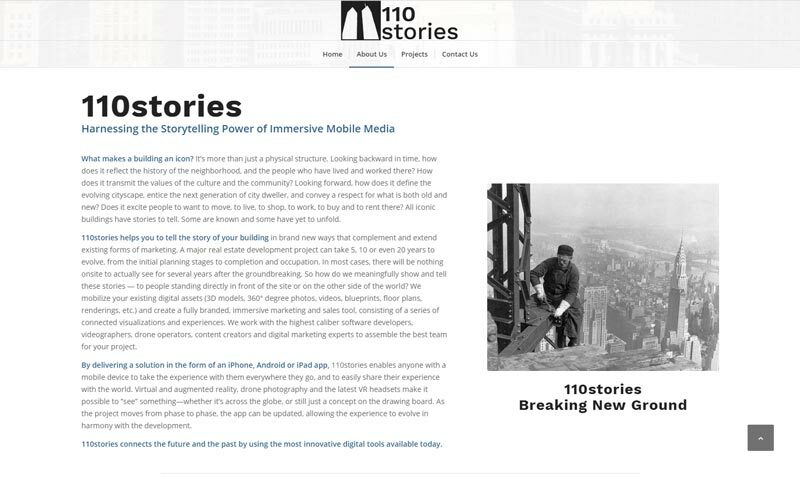 110stories specializes in visual storytelling, so their website couldn’t be a cookie-cutter solution. Speed of Like worked with 110stories to create a streamlined site that presented them clearly, while adding in video and subtle animations to suggest movement and a reality beyond the screen. To give a sense of motion, progress, and time, Speed of Like created a time lapse video for the first impression visitors to the site are met with. Overlaying the new logo, one can see the possibilities of filling in the space left by the Twin Towers—or any planned and as-yet-unfinished construction site. The video was carefully designed to loop nearly seamlessly, creating the impression that there is no beginning or end to the possibilities. “They were extremely hands on and offered me valuable insight that went beyond traditional web design, making a point of really learning about what I do, and how I want to communicate with my audience. Their overall knowledge of UX/UI, design and strong writing abilities helped enormously. I am very, very happy with the work done by Speed of Like and am certain that I will use their services again.